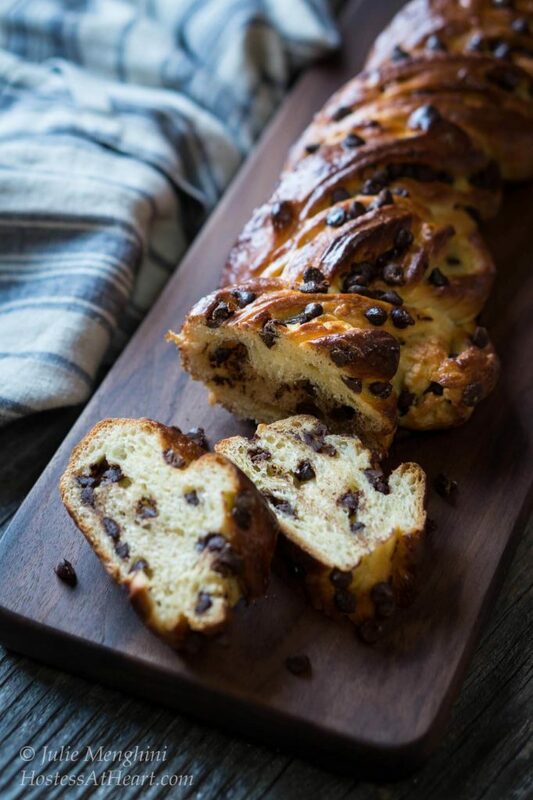 If you like sweet bread, especially sweet chocolate bread, this Sweet Russian Chocolate Braid is for you! 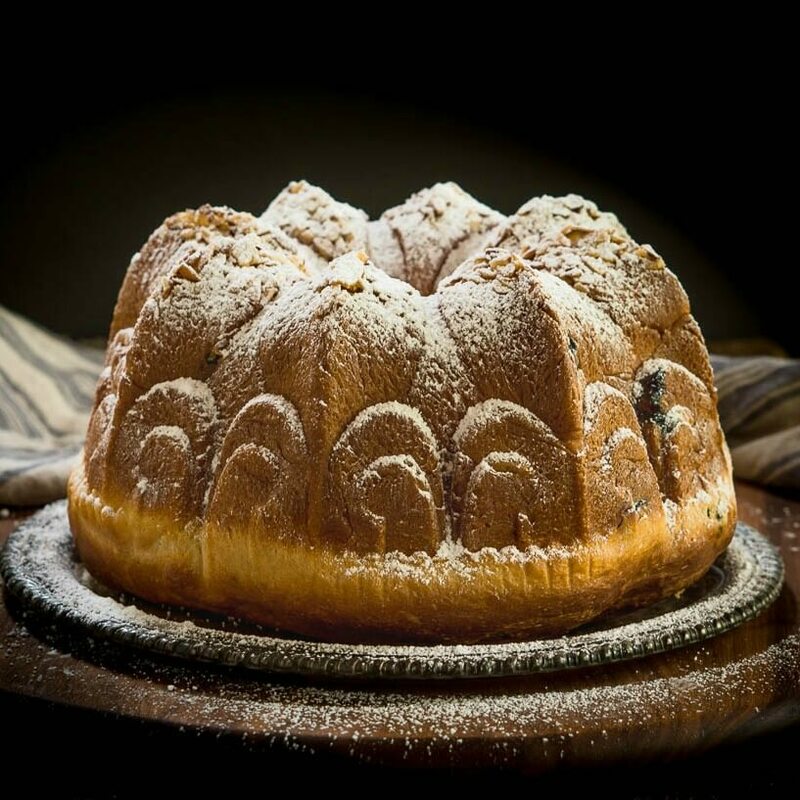 It is soft and tender and filled with pastry cream. I was given some beautiful books over Christmas on baking bread, and I just couldn’t wait to dive into them. Months later they were still waiting patiently on my coffee table. That is until I laid eyes of the Sweet Russian Chocolate Braid. This month’s Bread Bakers is hosted by Shireen at Ruchik Randhap (Delicious Cooking). The theme is Cacao, cocoa or carob in any form. Well, I love chocolate as much as I do bread so this was one month I didn’t want to miss. I always choose something that I haven’t made before. When I read the recipe and technique of the Sweet Russian Chocolate Braid in “The Best of Fine Cooking, Breads addition”, I wanted to give it a try. It looked gorgeous and made my chocolate loving heart beat a little faster. The dough was difficult to work with. It was very wet and sticky. The recipe said this was normal. So while delicious, mine doesn’t exactly resemble the braid in the book. I’m o.k. with that though because I think it still turned out gorgeous! 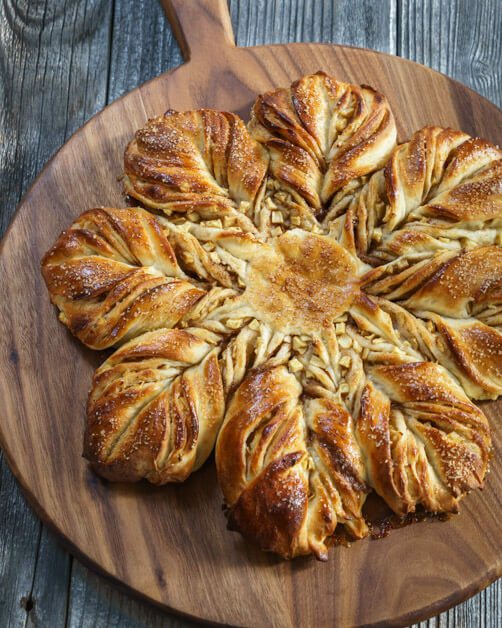 If you like sweet bread, especially sweet bread with chocolate, this Sweet Russian Chocolate Braid is for you. 3 tbsp all-purpose flour unbleached is o.k. In a medium saucepan, warm the milk over medium heat. Using a sharp knife, slice the vanilla bean vertically. Scrape out the seeds and add the pod and seeds to the milk. Cook until a skin forms. Remove the pan from the heat. In a medium bowl, combine the sugar, flour, and salt, then whisk in the egg yolks. Remove the pod from the milk mixture. In a thin stream, slowly whisk in the warm milk. Return this mixture back to the saucepan. Cook over medium heat until the mixture is extremely thick and gluey, about 5 minutes. Press a piece of plastic wrap down over the surface of the cream to keep a skin from forming. Let cool and then refrigerate until ready to use. In a small bowl, mix 3 tablespoons of flour with the yeast and then whisk in the water. Set it aside for 10 to 15 minutes or until it begins to get puffy. Fit a large capacity food processor with the metal blade. Put in the remaining flour, yeast mixture, potato, egg yolks, vanilla and sour cream. Process the ingredients for about 1 minute. Remove the dough from the working bowl and knead it by hand on a clean countertop for 1 minute. Return it to the food processor, running it for another minute and then kneading it on the counter for 30 seconds. Repeat this step until the dough is very smooth about 2 to 3 times. Return the dough to the processor. Add the sugar and salt, kneading again in the processor and then on the counter until the sugar is dissolved. The dough will soften considerably and become very sticky. Return the dough to the processor and add the butter process until well incorporated and then kneading it for another minute on the counter. The dough will cling to the sides of the processor and feel warm to touch at this point. Kneading on the counter should cool it and help firm it up. Transfer the dough to a large bowl that has been lightly oiled. Cover and allow the dough to rise until approximately 3 to 4 times its volume, approximately 3 hours. Line a baking sheet with parchment paper or butter it. Roll the dough on a floured surface into a rectangle measuring 13x16 inches and about 1/8 inch thick. Stir the chilled pastry cream and then spread it over the dough in a thin layer. Sprinkle the chocolate chips evenly over the dough. Roll long edge into a cylinder and pinch to seal. Put the cylinder on the baking sheet. Using a sharp knife cut the cylinder down the middle lengthwise. Arrange the strips so the filling is facing up and they are lined up side by side. Working from the center, wrap them around each other to form a twist. Cover the dough and let rise until it's large and puffy, and remains indented when lightly pressed with your fingertip, about 45 minutes. Preheat oven to 350 degrees F. Brush the dough with a beaten egg. Bake in the center of the oven until golden brown, approximately 35 minutes, turning the pan halfway through baking. Cool on a rack for 1 hour before slicing. Recipe originated in Fine Cooking Breads Winter 2015 edition. 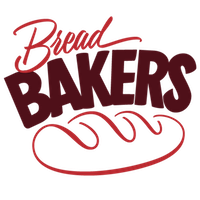 For more delicious bread, check out the recipes for other Bread Baker participants. 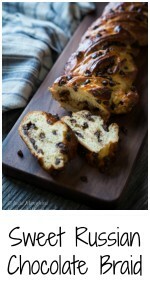 Here are a couple more of my favorite Bread Bakers posts! I really like your recipe “RUSSIAN CHOCOLATE BRAID” here. Healpful information for me. PS: Your pictures are looks so nice. Thank you so much! I appreciate you stopping by and your kind comments. Thank you Jane! This bread was a little finicky to work with. The second time around will be much easier. It was a very wet dough so instead of adding more flour, I just handled it the best that I could. It was so pretty and delicious in the end though. Thank you so much Mireille! As much as I tried failing this bread, it was resilient enough to actually turn out! Have a wonderful day! Gorgeous bread, love the chocolate chips peeping out from the bread. 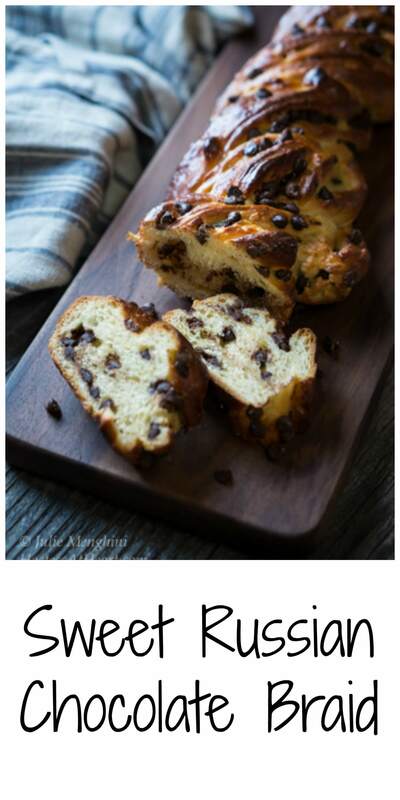 A beautiful bread, love the chocolate chips peeping out from the bread. That is a beautiful rustic looking braided bread. Love how airy and delicious it looks. a beautiful braid. Just the right amount of chocolate and a treat. Hoping to try out this bread soon. This looks so beautiful Julie!! I wish I had a slice right about now! There’s nothing more beautiful than a perfect slice of bread and this is even better with chocolate! 😀 I absolutely love that braid! Thank you Dini! This was one of those breads that shouldn’t have even turned out but did. I may try it in the mixer instead of a food processor next time. Have a nice day sweet girl. I absolutely adore braided breads. Yours looks like a jewel ! stunning! Wow, this bread is making my mouth water! It looks so fluffy and soft. And I know what you mean about time going so quickly…sometimes at night when I think back over my day, it’s hard to understand where all the time went! Thank you! Sometimes I end up with a bigger to do list at the end of the day than when it began! This is a beautiful loaf and looks delicious, to boot! I have such a hard time making a bread that doesn’t look like a half-melted doorstop. Nice work! Oh my Sweet J! I’d sure like to know why your bread isn’t behaving! I’d be glad to help if you have any questions! How did your bread turn out Anita? I found that it took up to 4 hours to rise and I’ve updated the recipe to indicate this. Thank you for letting me know Anita. It is a daunting recipe for anyone that doesn’t like waiting for the results which are most people! I think it’s wonderful that you are involving her in the kitchen. Both of my children were and are now very proficient in the kitchen. LOL! I would love to share. Someone suggested using this brad in french toast. Wish I still had a few slices to give that a try! This looks great, Julie! And I love and totally respect the sheer amount of chocolate in this bread :). Happy FF! If I had to have one vice it would be chocolate. Thank goodness that isn’t the case because I have many lol! This looks wonderful, Julie! What a beautiful and delicious bread! Thank you Anna! Have a wonderful weekend! I have seen bread recipes that use potatoes, but never tried it. This bread looks so beautifully breaided and perfectly baked. Look so professional, too. You should get yourself a bakery, Julie. 😀 Happy FF! Thanks Jhuls! I even had a comment from someone that puts them in pancakes! Julie, this is pretty ridiculous, in a totally good way. I am in love with this loaf! The photos are amazing too. Wow. just wow!! Thank you so much Karen! I have love affairs with bread too. Absolutely stunning! I’ve used potato as a ‘secret’ ingredient in baking (and pancakes) and it does add a magical softness. Great photography too. Thank you so much Pam! I’ve never heard of the potatoes in pancakes! Thank you! This bread can be made without the filing but there are also eggs in the dough so I don’t think this would be the recipe for you. So pleased you stopped by for a visit! I love Fine Cooking and you certainly showed them off well with this gorgeous loaf of bread. Great Job. 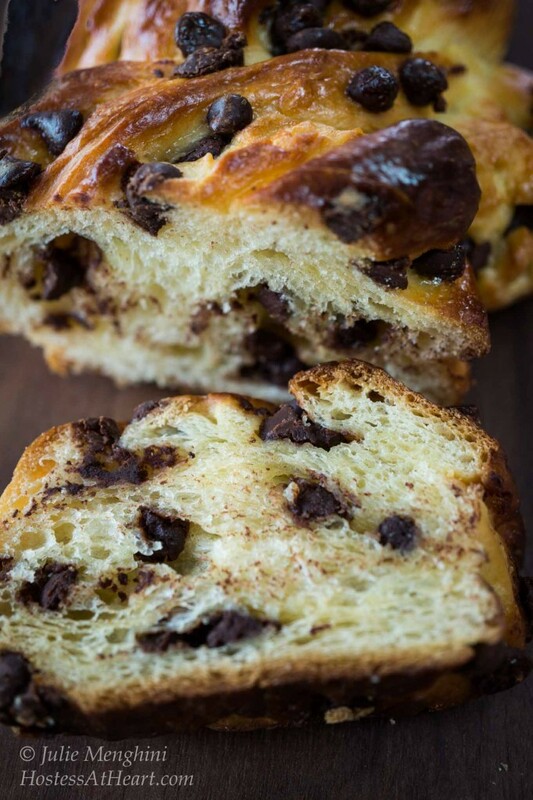 Oh Julie, your Chocolate braid has won my heart….can’t take my eyes off it! Such a beautiful braid studded with chocolate! I can almost taste it! A sure winner with kids…thanks so much for participating in this event! Thank you Shireen! It was a theme after my own heart! I love the look, Julie! Perfect for a snack or entertaining! Thank you Cindy! I really loved this theme! Your bread turned out marvelously Julie. Great job! Such a gorgeous bread!! 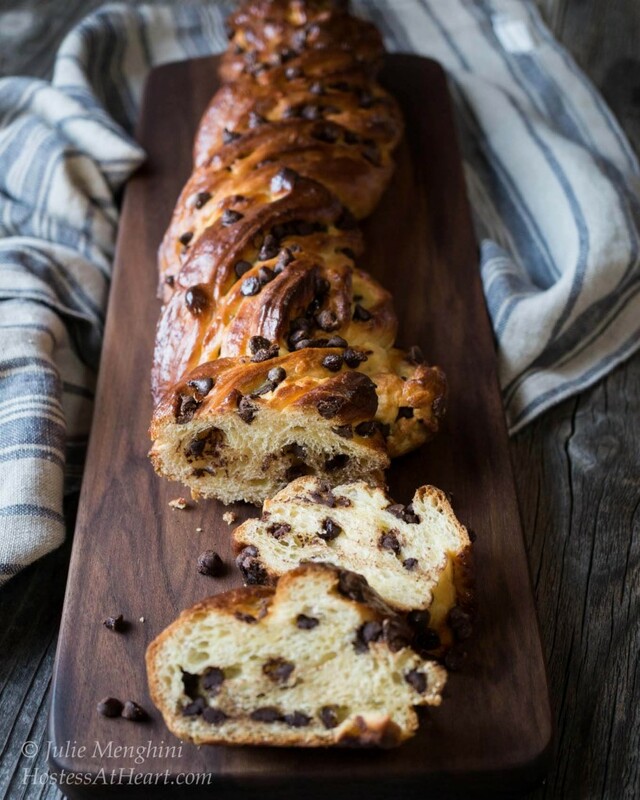 The chocolate chips and the bread look so inviting 🙂 I am in love with this one! Thank you Judi! Heading back for a correction. Thanks for the heads up! Oh yum, Julie! What a gorgeous bread – really beautiful. With the chocolate in it, I know I would love it! I wish I could try all of the breads you make. Each one is so unique. Interesting that this one has potatoes in it. Does that contribute to the moistness of the bread? I really like the lighting in your pictures. It is perfect to show off your bread! Thank you, Shari! The potato does add to the moisture, kind of like zucchini or carrots. It’s been cloudy here for months. If the sun ever comes out again, I wont know how to take a picture! Your pictures have a moodiness to them that I just love! Thank you Sonal! You always make my day and I hope yours is great! 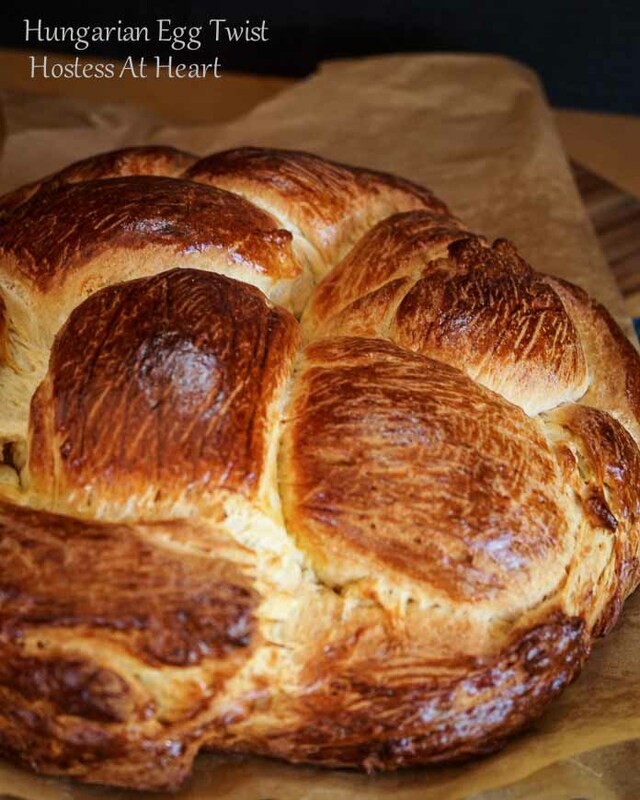 That really is a pretty braided sweetbread. My mother often gave us a sweetbread for breakfast but nothing this pretty. Awe Karen thank you so much! As much as I tried to screw it up, it just turned out anyway. 🙂 Thanks for stopping by! What a beautiful chocolate slice of hearty goodness Julie! And you would never know you had trouble braiding it! Looks so yummy! Thank you Linda! It was a very forgiving bread, thank goodness! Thank you Loretta! They really warned about using flour and just wanted you to use the coolness of the counter to firm it up. I think I’d try a bit more flour. Your glasses look great as you do Loretta! Are you getting used to them yet? Enjoy your day. It’s pretending to be spring here and that’s fine with me! Wierd Julie, I never seem to get notifications on WP anymore that you’ve responded to my message. I wonder why? I’ve had the glasses for about a month now, the transition ones…..they turn real dark outside, so you don’t have to switch to sunglasses, but my beef is that when you get indoors, it appears dark for sometime and then transition to regular glasses; I didn’t think it would take that long to switch. I like the idea of just one pair of glasses, but it will take getting used to. Our weather was just amazing today, 75deg and tomorrow a predicted high of 79. I start my volunteer work in the garden outdoors tomorrow, can’t wait! I hope spring stays around for you. I wonder what the deal is on WP? I know WP have made some changes but I hope they don’t cut me off. I see comments made on my own posts but have to go into a separate area to see comments that are responded to on other blogs such as your own. How exciting that you get to go to the gardens tomorrow! We are in the 50’s now and have even had a day last week in the 70’s. We might get a little rain. That would green things up. My eye doctor talked me out of transition lenses because of the driving factor. It’s a pain switching out sunglasses though. Oh well, at least I can see? I can only imagine how difficult it would be to braid wet dough! But it still came out looking beautiful and fabulous!!! Thank you so much! I did have my doubts, but very happy with the results. Oh yes! 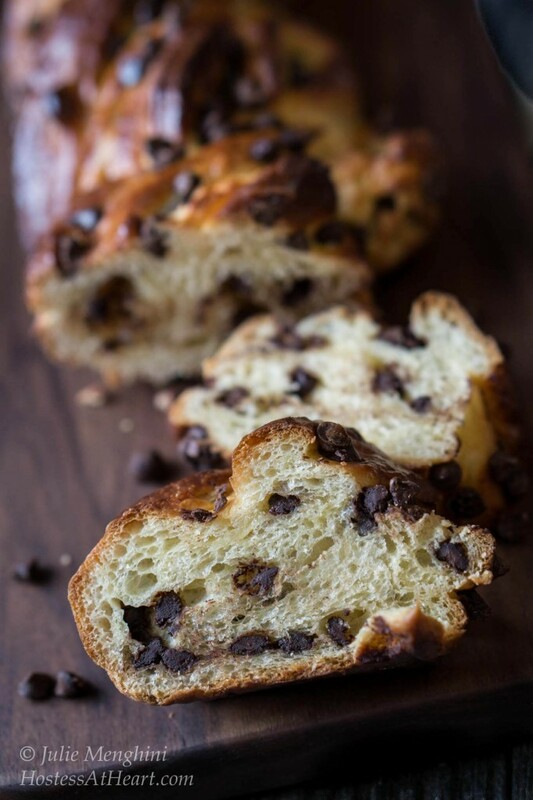 Your bread turned out marvelously.It looks airy and all those chocolate chips is simply divine! Thank you so much Renee! It’s going to be a great day for bread!